In his book published America as a Civilization, he wrote of the ill-defined communities in America, describing the nation’s citizenry as fragmented and unresolved. As he wrote the book, though, the architecture and popular culture of the country, began to take on a form of there own, an upgraded bigger and better American version. Nowhere can this be seen better than in the signage that was built in cities and towns and along highways across the nation. During the twentieth century, Lerner saw America to be a democracy of informality, a place of bigness, and technological prowess. His vision became a truism with respect to the signage being built as well. Ice skating sign in Ontario, California taken in 2003. 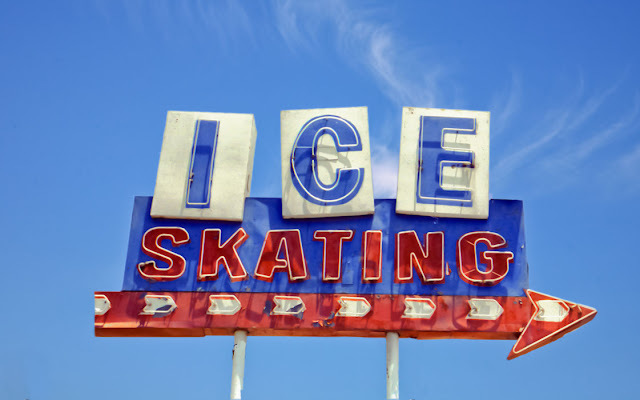 The ice skating sign is no longer red and blue; it's brown and white. I like it red and blue much better. After all, the color of the word "ICE" should have some blue in it because it signifies cold. Brrrr. One of my favorites. Look at the design; it's flawless. The Tucson Inn sign contains a pole for each letter of the word "Tucson." How clever is that? Check out the arrow; it sweeps around the word "Inn" like ribbon on a Christmas package. An added extra: A coffee shop sign behind the poles. Finally, if you look really hard you'll find the Vacancy/No Vacancy sign attached to the first pole. This Biscayne Blvd motel sign, the Sun n Surf Motel, is real retro--robin's egg blue with a Deco-like shape. 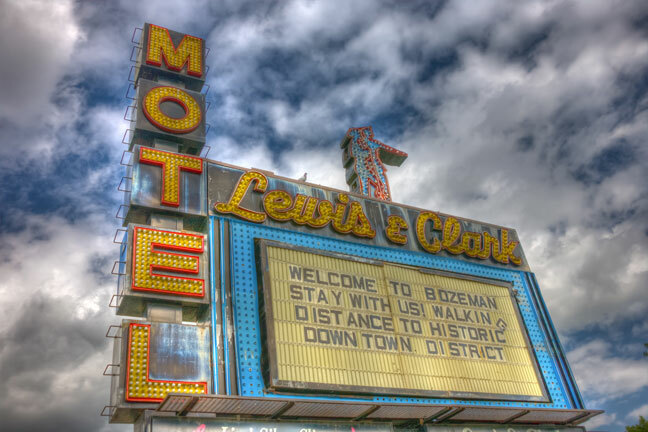 Lewis and Clark Motel, Bozeman, MT. The Lewis and Clark Motel sign is classic mid-century neon. Here it is in HDR. 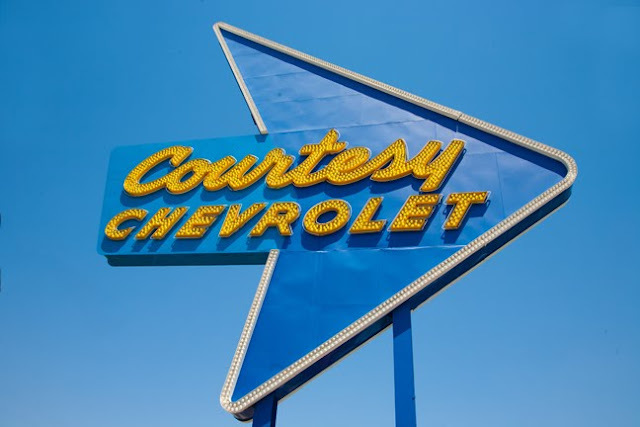 A must-see, the Courtesy Chevrolet sign has a classic arrow design. 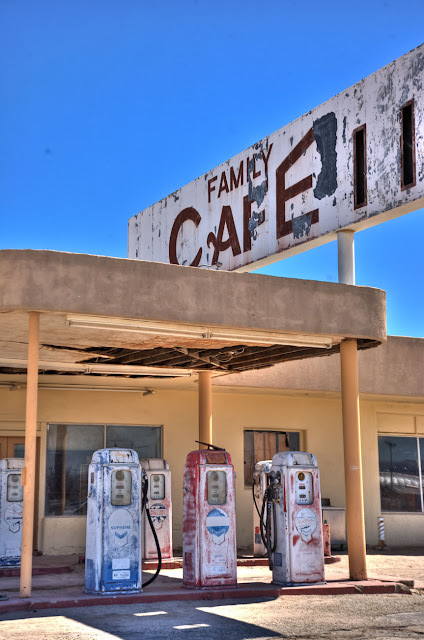 Gas station east of Palm Springs on Highway 10. This Family Cafe in Desert Center, California contains some worn out gas pumps. Cool vintage stuff! They just don't make them this tall anymore. 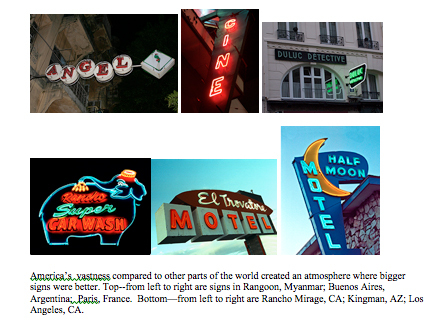 Height used to be an important sign trait in most locations in the United States, except some of the places where there are a lot of hurricanes. 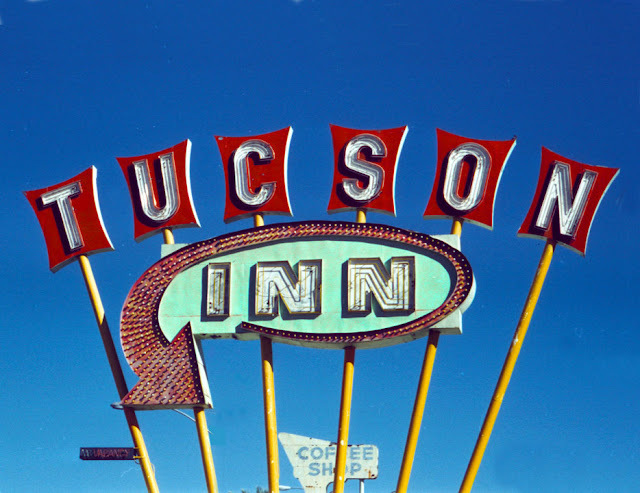 Tall signs are grand, rising into the sky as if they were catching a bit of heaven. This "bowl" sign was taken in Southern California and still is there, unusual for such a big piece of neon. 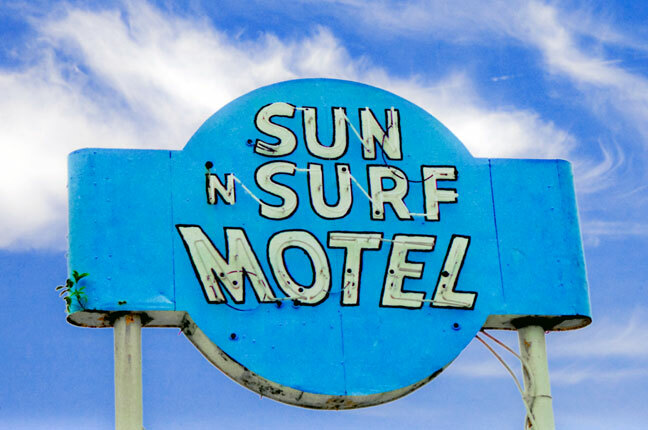 The steel in this sign is classic as are the letters at the end of each soaring pole. 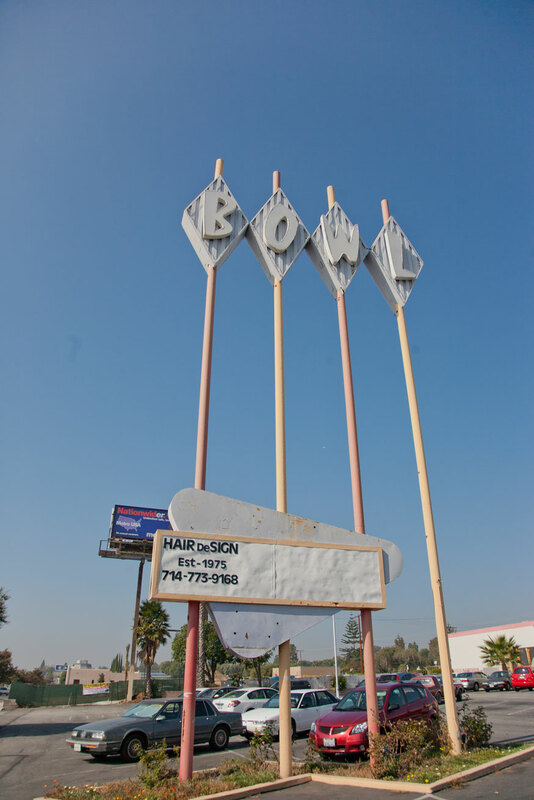 I have several versions of this bowl sign and a few others like it-long live steel and neon. Wow! Long name. 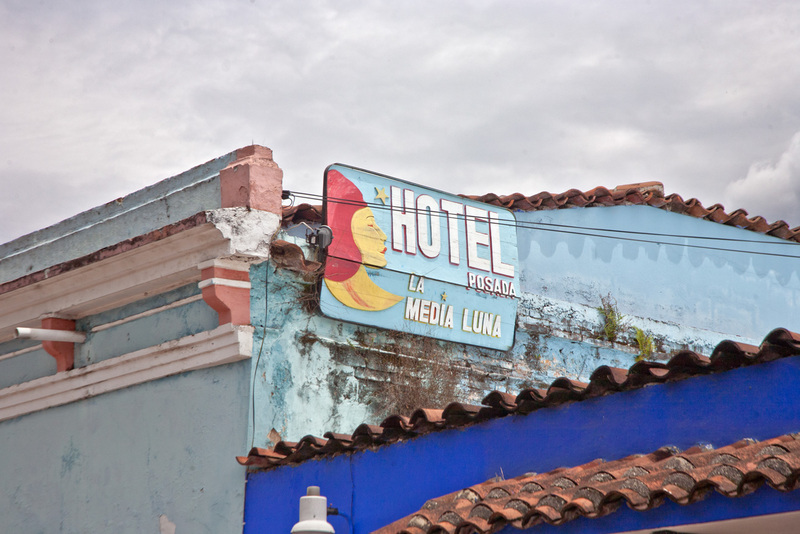 Go ahead and say it to yourself: Hotel Posada La Media Luna in San Cristobal de Las Casas, Chiapas, Mexico. This hotel is well worth looking into. It's right by all the action--bars, clubs, coffee houses and restaurants. Chiapas, Mexico has some of the most improved infrastructure in Mexico. Don't fool yourself into believing that this Southern state is riddled with drug violence. Not only did I stay in the lovely colonial city of San Cristobal de Las Casas, I also took the bus to the ruins at Polenque, a windy trip through poor villages, thick forests and crystal clear air. Not one sign of any disruptions by the drug cartels. The color and beauty of Mexico's interior should not be missed. The weather is almost perfect year-round and the tasty food is half the price of what it is in the United States.